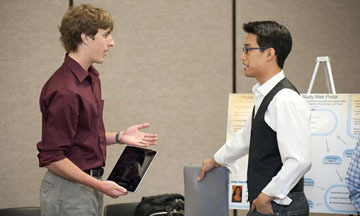 Bren School students were given two opportunities to meet with potential employers on Oct. 13, when the UCI Career Center hosted an Engineering, Science, and Technology Career Fair, while the ICS Student Council sponsored a quarterly Reverse Career Fair. Both were held at the Student Center. 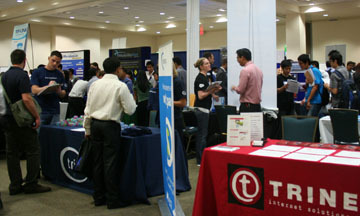 At the UCI Engineering, Science and Technology Career fair, hundreds of undergraduate and graduate students talked to representatives from 89 companies with hopes of gaining a job or internship. Companies included Google, Microsoft, Amazon, Intel, Verizon Wireless and Blizzard Entertainment. 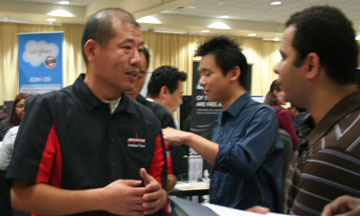 The Career Center hosts various career fairs throughout the academic year. 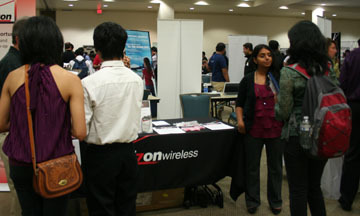 For more information, visit http://www.career.uci.edu. 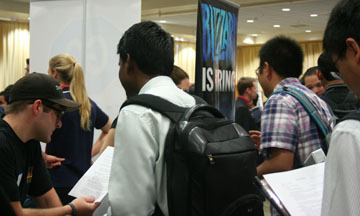 Badhri Sridharan, a Computer Science graduate student, speaks with a representative from Blizzard Entertainment after days of preparing for the fair by researching his companies of interest. 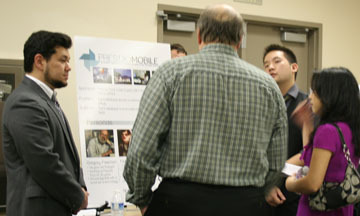 He noted that the fair featured a large number of organizations, including many of the big time players in his field. 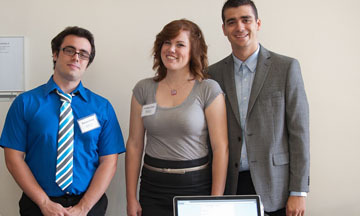 Senior Informatics major Chris Lang is the project manager of “UCI Field Study Web Portal.” The yearlong project’s aim is to transform UC Irvine’s current information-only Field Study website into community partner listings for which students can apply. Lang hopes to secure a job as an associate producer by the time he graduates. 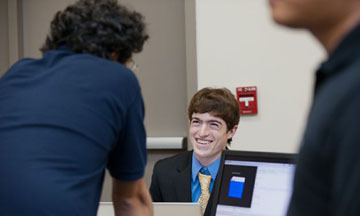 Ryan Skinner, a junior Computer Science major, displays his self-made project, which facilitates the building of worlds in video games. Skinner enjoys video games and programming, and hopes to find an internship with a company like Blizzard Entertainment. 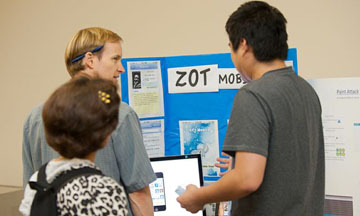 Yoon Lee, a Computer Science major graduating this quarter, presents his solo project, “ZOT Mobile.” The app is a flagship application for students, faculty and visitors, wherein features and functionality of the app simplify student life at UCI and deliver useful information. Some features of the app include a campus map, directory, shuttle schedule and library look-up. Lee says he has gained valuable training through a previous internship with MobilityWare. Ideally, he would like to work as a compiler or with mobile computer applications.